Before venturing into the alley of Future Vision it would be appropriate to rewind and dwell on the birth and various life stages of this sector. The Indian IT Services Industry has undergone many changes over the last decade but has become a globally recognized success story. The evolution of this industry can be categorized into three broad phases. Phase 1: Emergence (1998 – 2000) – Post 1998 the industry came into its own with Software and Internet Services seen as the new growth engines. The first Offshore Development Centres were set up to provide low cost/high quality IT services from India-based locations. The industry grew at a scorching pace, recording almost 50 percent CAGR. 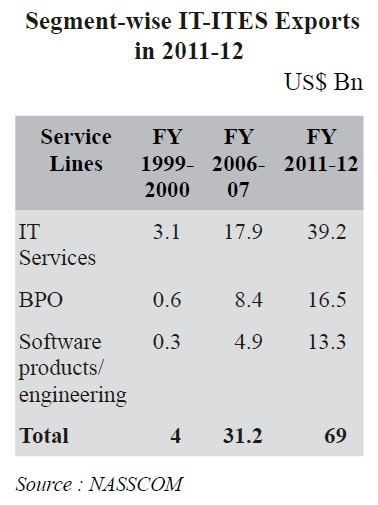 Growth to India was driven by IT services spurred by the Y2K phenomenon, focused largely on Application Development & Maintenance (ADM) and software R&D services. Phase 2: Resilience (2001 – 2005) – The end of 2001 brought with it the dot com crash and a host of new challenges for the industry. While the sentiment and view of ‘technology’ services post the crash was extremely negative, Indian IT Services Companies proved their resilience by realigning their service offerings to serve geographical and vertical markets. In particular they took advantage of the need for technology cost saving in the US and Financial Services vertical to maintain an extremely strong CAGR of ~37 percent. Phase 3: Dominance (2006 – till date) - Driven by relentless growth, 2006 was the year which saw Indian IT Services Companies cement themselves as a force to be reckoned with. Backed by tremendous growth in offshore adoption and strong sustained demand from favoured areas such as the US and BFSI, five Indian companies racked up in excess of INR 45 Billion in revenues. Growth of BPO services and more recently, offshore delivery of IT services such as package implementation/systems integration, as well as remote IT infrastructure management have witnessed increased buyer adoption. Multinational companies aiming to replicate the offshore services model have rapidly scaled up in India. With core geographies (US) and core verticals (BFSI) nearing saturation, the industry has looked to develop new geographies such as Continental Europe and new verticals such as manufacturing, healthcare and retail. Additionally, increased focus on cost efficiencies and customer satisfaction has helped the industry to rapidly evolve from a provider of project based development activities to an “end to end” solutions provider. While the sector has maintained CAGR of over 30 percent in the tenth plan (2002-2007), the IT-ITeS industry has continued sustain growth rate in the Eleventh Plan (2007-2012) despite the global economic downturn, which has impacted the growth trajectory of the industry to single digits in FY 2009-10. With world wide technology spending declining significantly in 2009, and it being an export led sector with a key thrust on banking and financial services, there was single digit growth in export revenues. The industry in this phase (2008- 2010) has demonstrated maturity by reducing costs, focusing on new markets, investing in sales and development, domain expertise, enhancing operational excellence and thrust on customer centricity. Thus, there has been a marked improvement in FY 2010-11 and FY 2011-12. This unparalleled success saga has emerged from a tapestry of myriad factors. The liberalization of Indian economic policy, de-regulation of key sectors and progressive moves towards further integrating India with the global economy has been a key driver of increased IT adoption in the country. Government of India has played a key role in supporting development of this sector. From providing tax incentives under Section 10A/10B, setting up 52 STPI centre across the country, creating capacity and competition for telecom services to zero import duty on software are some of the steps taken for this industry to develop as the leading global sourcing hub of the world. The phenomenal growth can be attributed to only some states and regions like Karnataka, Andhra Pradesh, Maharashtra, Tamilnadu, NCR. This skewed growth is a consequence of these states being proactive and coming forward with a variety of incentives like capital subsidy, reimbursement of stamp/ transfer duty, registration fees and patent filing costs, exemption from statutory power cuts and industrial tariff instead of commercial, waiver of NOC from Pollution Control Boards, Simplification of Labour Laws, Additional Floor Space Index, venture funding and special incentives to start up companies, recruitment assistance, etc. The states which had allowed setting up of private engineering colleges in 1990s had the advantage of availability of human resource. 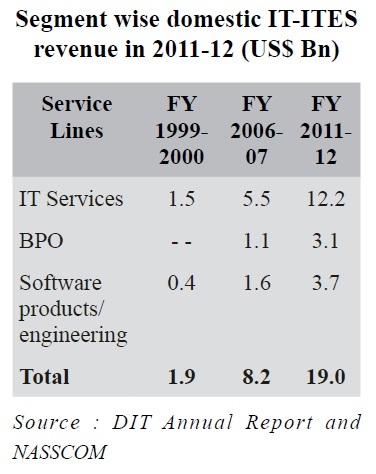 The exports revenue of Indian IT-ITeS industry has grown from US$ 4 billion in FY 1999-2000 to US$ 69 billion in 2011-12. The export industry is diversified across three major focus segments – IT Services, BPO and engineering services. While IT Services have been the mainstay of the industry, BPO and engineering services sector has built upon India’s value proposition and today there exist integrated service providers across the three focus areas as well as niche providers. The direct employment of IT-ITeS industry has increased from 0.52 million in the year 2000-01 and has reached 2.8 million in FY 2011-12. About 2.28 million jobs have been generated during the last decade. This also translates to the creation of about 8.9 million indirect job opportunities in diverse fields such as commercial and residential real estate, retail, hospitality and transportation, etc. IT-ITeS/BPO industry provides employment to people with various skill levels i.e. Engineers, Lawyers, Arts/ Science/Commerce/ Literature etc. graduates; High School Pass outs etc. With 30 percent women in the workforce this sector is the largest employment provider for women. The domestic IT-ITES industry in India is at an inflection point today. As Indian consumers and corporations rapidly adopt mobile phones, and Internet access and broadband connectivity expand, there is likely to be a significant increase in spend on IT hardware, software and services. Finally, the biggest domestic opportunity in most sectors (e.g., banking, insurance, retail, telecom and healthcare) lies in tapping the opportunity to serve the billions of underserved at the bottom of the pyramid. The other big positive is that our knowledge sector is largely driven by youth—the average age of employees in the industry is between 25 and 28. The basis of the “demographic dividend” is that in 2020, the average age in India will be only 29 years, compared with 37 in China and the United States, 45 in Western Europe, and 48 in Japan. Moreover, 70 percent of Indians will be of working age in 2025, up from 61 percent now. According to the Indian Labour Report, 300 million youth would enter the labour force by 2025, and 25 per cent of the world’s workers in the next three years would be Indians. India’s young demographic profile, where over 3.5 million graduates and postgraduates including over 500,000 IT & Electronics & Communication Engineering graduates are added annually to the talent base, will continue to give us an unassailable edge. Today, no other country offers a similar mix and scale of human resources. Department of Electronics and Information Technology (DeitY) has recently introduced a new IT Investment Regions (ITIR) Schemes to develop infrastructure facilities in Tier II and Tier III cities. Few states have already shown strong interest and have begun taking steps to set up such ITIRs. DeitY has formulated National Policy on IT which aims to maximally leverage the power of ICT to help address economic and developmental challenges the country faces. The National Policy on IT focuses on application of technology-enabled approaches to overcome developmental challenges in education, health, skill development, financial inclusion, employment generation, governance etc. to greatly enhance efficiency across the board in the economy. The policy seeks to achieve the twin goals of bringing the full power of ICT within the reach of the whole of India and harnessing the capability and human resources of the whole of India. The main aim is to harness the potential of the software and services sector to contribute to the country’s development and growth, particularly in terms of investment, exports, employment generation and contribution to GDP; to retain India’s leadership position as a global IT-BPO destination, consolidate and grow in both mature and emerging markets. 1. Enhance innovation and build India as the hub for global design, IP and product development. 2. To harness ICT technology for inclusive growth, promote gender inclusivity and ensure balanced regional growth. 3. To nurture and accelerate the growth for the SMEs and startup enterprises in the country. 4. Build India centric software industry, drive domestic market IT adoption, and enhance SMB competitiveness in the country. 5. To focus on development of ITITeS/ BPO industry beyond the current 7 Metros including NCR which account for 90 percent revenue. Over the next decade, several global mega trends will shape the technology and ITeS/BPO industry as they reshape the global economy. Hence with increased GDP growth of emerging markets, and shrinking working age populations, these megatrends will present a new set of hitherto untapped opportunities that will include emergence of new verticals, service lines, geographic and customer segments. On the back of these trends, the addressable market opportunity for the IT-ITeS/BPO sector is likely to expand from the current USD 500 billion to USD 1.5 trillion by 2020.
of about 1.4 million people and incremental indirect employment of 2.3 million. Attaining these ambitious outcomes will require breakthrough collaboration amongst central and state governments, industry players and industry associations. The future growth trajectory will depend on how these are tackled. 2) Reduced competitiveness of the industry due to diminishing employable talent pool, rising costs due to concentration in Metros and inadequate infrastructure in other towns. 3) Improving the supply and capacity of suitable talent as industry has to spend + 1.5 percent of its revenues on training to make them employable. 6) Direct and indirect protectionism in key markets. Build an enabling policy environment for India to sustain and grow its leadership in the global sourcing sector in developed and emerging markets. To support small and medium enterprises and provide competitive edge through fiscal benefits, innovation fund and incubation. 1. To build world class infrastructure in identified tier II and tier III cities to create new hubs for industry development as potential centers of excellence. 2. To address the gap of employability through skill development initiatives. 3. Some of the recommendations relating to IT-ITeS industry would cut across the other sub-groups of DeitY for the twelfth plan and also come under the purview of other Ministries/departments (viz, MHRD, DOC, MEA, MSME). Anita Bhatnagar Jain, Joint Secretary, Department of Electronics & Information Technology, Government of India.